Campaign and the IPA uncover the breakdown of gender and ethnicity in the biggest IPA member agencies. 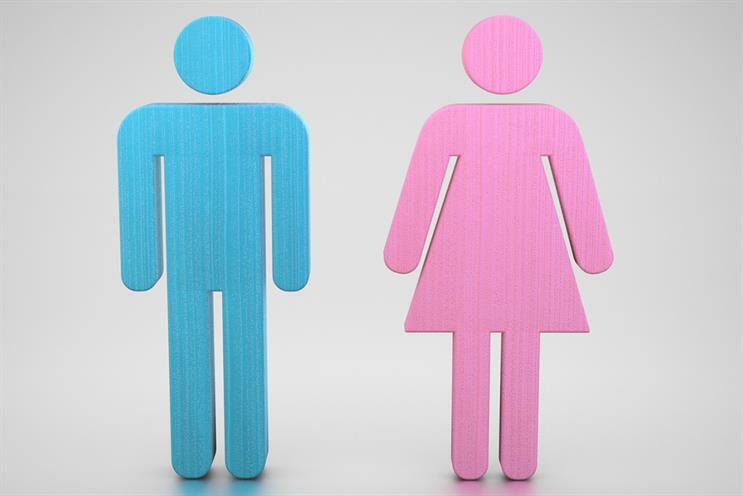 In part one of our report, we examine the gender make-up of the industry. What does a successful advertising industry look like? In the future, it will probably not be led by today’s predominately middle-aged, middle-class, white male cast. This is not because of a naïve moral outlook but because diversity of thought is crucial for business success and fresh thinking is most likely achieved through the col-laboration of people with different backgrounds, experiences and ways of viewing the world. Over the following pages are the results of Campaign and the IPA’s first diversity survey of the industry, which looks in detail at the gender and ethnic make-up of advertising’s biggest agencies. It is the result of months of research, kick-started in April 2015 by Tom Knox, when he outlined the "Here for good" agenda for his two-year IPA presidency. Campaign and the IPA agreed to publish annual tables that show the breakdown of gender and ethnicity by seniority in the biggest IPA member agencies. Let’s be clear: this is not intended to name and shame any specific agency. For that reason, the individual agency data has been listed alphabetically, not ranked. Campaign appreciates that this is sensitive information, and that figures can easily be skewed. 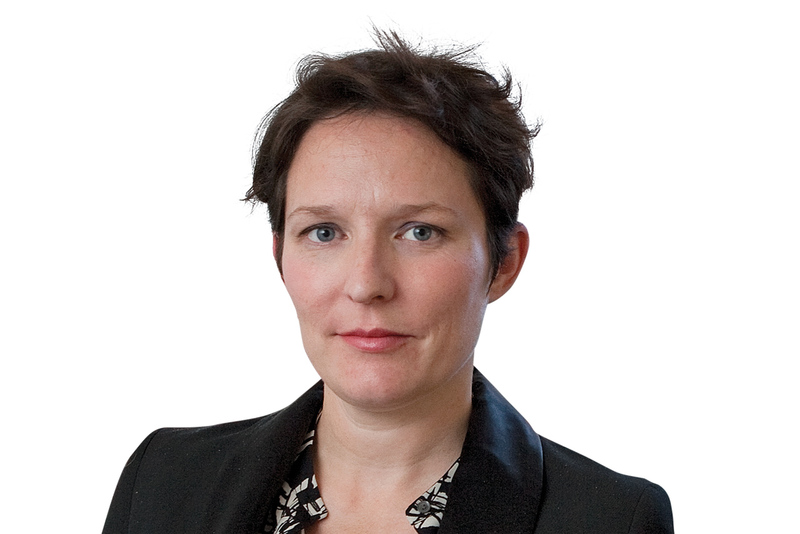 If, for example, an agency has a white, male chief executive, this does not necessarily mean that the operation he presides over is not diverse, nor that the individual in question is not the best candidate for the role. All of the information has to be taken in context. As an article in Harvard Business Review explained earlier this month, there can be two problems with corporate diversity policies. The first is the danger of alienating and threatening those already in power who feel they will be unfairly treated, even if there is no evidence of this. Diversity should be inclusive and be both a collective endeavour and benefit. It is why the recent outrage over Twitter appointing a white man to be its head of diversity was misguided. Equality is not something to be discussed in niche groups – everyone has to be at the table. The other problem with a diversity policy is that it can, counterintuitively, make organisations less accountable for discrimination – the mere existence of a policy, even if not properly implemented, can blind some to the continuing issues. This is why Campaign and the IPA are calling for specific outcomes. 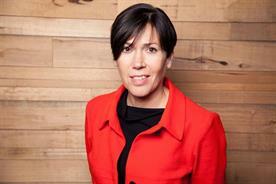 On gender, we want 40 per cent of the most senior levels of employees to be female. Publishing this snapshot of the industry at the start of 2016 will provoke controversy. But we are doing it because it matters, and we think it should matter to you too. Consider this the start of the conversation. We recognise that diversity is a complex issue and welcome your comments, suggestions and criticisms. But now is the time to act. When I announced as part of my "Here for good" agenda that the IPA would publish a list of our biggest agencies’ gender and ethnic splits by department and seniority, I was excited by the strength of the reaction. The overall gist of the response was: "Ooh, that’s bold… hope it doesn’t make us look bad." The reality is that, in terms of being progressive and diverse employers, advertising agencies compare favourably with other professional service companies. That we are relatively good in this area is not, of course, the same as saying we are absolutely good: we have a lot more to do before women and the black, Asian and ethnic-minority communities are proportionately represented in our workforce. I would like to take this opportunity to thank all the agencies that took part in the survey and to say how heartened I was by the positive support we received from the chief executives of the agencies we spoke to. Industry leaders clearly recognised the importance of transparency and setting a benchmark now, against which we can measure our collective progress in the future. Being able to talk about issues of gender and ethnicity openly and without trepidation is vital to us making progress and attracting the talented, diverse workforce we all want. So what are the headlines and where are the big areas for us to focus on? We’re starting this week with gender and the survey confirms what many of us intuitively know: overall, advertising is gender-neutral but, as people move up through the ranks, the percentage of women declines to the point where less than a third (30.5 per cent) of those whose job title is chair, chief executive or managing director are female. This number needs to be put into context. It is already 5 per cent above the figures found in the most recent government survey of FTSE 350 companies and significantly ahead of the number of female partners in the "magic circle" law firms (18.8 per cent, according to the Chambers Student 2014 Gender In The Law Survey). It is also encouraging to note that the future trend is positive given that what we defined as "middle managers" are nearly 50/50 gender split. 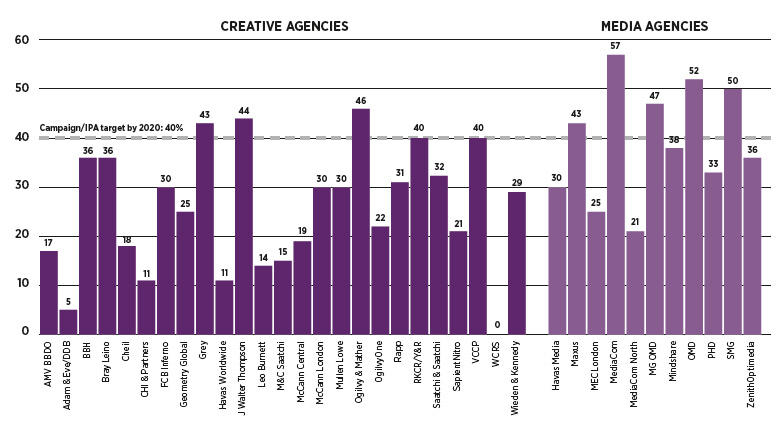 Two things in particular leap out from the survey: first, across the board, female representation is higher in media agencies than in creative agencies. 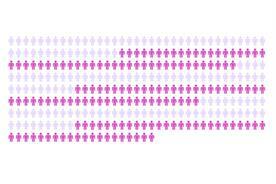 Second, there is a real problem with not enough women (only 24.6 per cent) working in "creative/design". These two findings are obviously connected because media agencies don’t have large creative departments dragging their female numbers down. It seems to me that creative agencies could learn from the cultures and working practices of media agencies in creating workplaces where women flourish and leadership roles are filled by inspiring role models such as Tracy De Groose, Lindsay Pattison and Karen Blackett. It remains an uncomfortable truth that men dominate creative departments and this cannot be good for creativity and our ability to solve our clients’ business problems. Finding ways to encourage more women into creative departments and keep them there is an urgent necessity and I suspect will require a sea change in culture and ways of working. Of course, I expected lots of interest in the data comparing men’s and women’s pay. This is going to be a high-profile issue as the government phases in compulsory gender pay gap reporting for companies with at least 250 employees from the spring. So, did we uncover evidence of systematic and significant discrimination when it came to salaries? The good news is that the answer to this is no. In some areas (eg. leaders in creative agencies), men and women are being paid the same or substantively the same as one another. While it is true that, in some categories, there is a difference in favour of men of 2-3 per cent, it seems likely that this is being driven by the impact of actual employee hours, including flexible working, on salary. Future surveys will attempt to take this into account. I want to be clear that this is not a league table. I’m sure that Campaign’s readers will pore over their own agency’s numbers in particular. If by publishing this data we foster healthy discussion about what more could be done to promote a more representative employee base, that’s a start. The intention is that this survey will be repeated annually and we have set ourselves some bold but achievable goals. On gender, our goal is that, by 2020, women will hold 40 per cent of senior positions within all agencies. Furthermore, this same level of representation will exist at each stage of the career ladder (executive, manager, head of department, director and C-suite). Achieving this will set up a talent pipeline to benefit all of our businesses. The IPA will support member agencies in taking the practical steps that will ensure these goals are met by consulting, developing and implementing new initiatives to join our existing talent programmes and our renowned qualifications programme. The first new initiative we are developing is a programme that will help agencies encourage more women back into work after career breaks (often, but not ex-clusively, after having left to start a family). Research shows that many of these talented, experienced women want to come back to work but they need help to do so. One of the many reasons I am proud to work in advertising is that I have always thought we are a meritocratic, open-minded bunch. The reason why advertising is a UK plc success story is that we have embraced diversity and are ahead of many of our fellow creative industries. This survey shows that there is no room for complacency, but it also reveals that advertising has the potential to achieve real leadership in the fields of both gender and ethnic diversity. This first chart (below left) is significant because it shows that the industry, as represented by the responding IPA agencies, is gender-neutral overall. The 50.4 per cent figure for women is in line with the UK population. The most recent IPA Agency Census (2014) suggests that the industry is just as successful at recruiting women as men. It showed that 58 per cent of agency employees under the age of 25 are female. 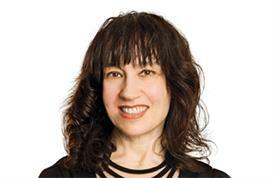 Where are the women in agencies? 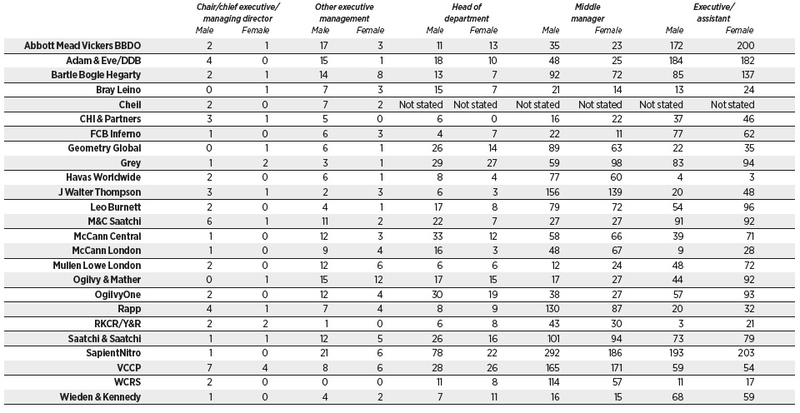 This chart shows where the gender differences lie by department. Creative and tech (which comprises programmers, user-experience specialists, web designers and IT support) departments have a significant male bias in the biggest agencies. The IPA says that this bias appears to run from junior through to senior levels. Such bias, particularly in creative departments, is likely to have an influence on the levels of seniority that females are able to reach. It starts when you’re a kid. If everything about computer science looks like it was built for a boy, then, sure enough, girls are less likely to stick with it. And when girls drop out, there are fewer female role models in education and work who have studied STEM subjects (just 14 per cent of the workforce, according to WISE). Add in busy people who keep hiring people in their own image for comfort and speed… and an unvirtuous circle emerges. We’re open-minded, rational creative beings, right? We understand that gender diversity is proven to lead to greater profitability. And that people from similar backgrounds, who talk the same and look the same, rarely break new ground. In that context, the under-representation of women in technology roles in agencies isn’t just depressing, it depresses our collective progress. So why, really? A lot has been said about how complex this issue is, but I suspect it’s simpler than we imagine: the seeds of (un)conscious bias in the world are sown at school, then grow into hardy perennials at work. • Are you just hiring people like you? Ask yourself that question, particularly if you lead a technology function. • Make sure you have female role models everywhere and that you’re creating the conditions for more at every level. • "Creating conditions" means actions, not just words: conduct a regular equal pay study, set and review benchmarks for diversity, update your flexible working policies, insist that women are a prominent part of the hiring process and that your onboarding process helps everyone, regardless of gender. • For tech roles, we’re competing against media and tech companies. Upskilling is a constant need. How will your agency deliver that in spades? • Do your research: publicise any technology roles via tech groups such as Ada’s List and come along to The Great British Diversity Experiment. • And if you have a daughter, tell her the stories of Ada Lovelace and co, then give her a copy of Belinda Parmar’s Little Miss Geek. Progress is coming to a technology team near you, ready or not. How many women are at the top? It is striking that as the roles become more senior, the gender split becomes considerably less balanced. While women account for 56.1 per cent of the junior agency roles, this drops to 39.2 per cent at the head of department level and 30.5 per cent in leadership positions. Media agencies perform significantly better on gender balance than creative agencies, with women making up 37.5 per cent of those in the most senior roles and 41.3 per cent in other executive management positions. This compares with 25.7 per cent and 27.3 per cent in creative agencies respectively. As Tom Knox explains in his introduction, key to this discrepancy could be the impact of big creative departments, which are predominately male, dragging down the ad agencies’ figures. The IPA’s challenge is for agencies to increase female representation to 40 per cent at all levels. 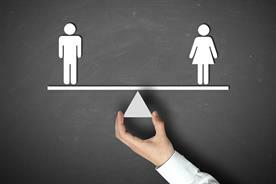 According to 20-first, a gender-diversity consultancy, a company’s executive committee must be 25 per cent female for women to have critical mass, and be 40 per cent female to be properly balanced. Using this measure, media agencies are nearly there at all levels of seniority, whereas creative agencies still have some way to go. 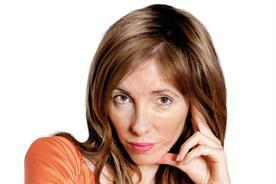 Why do media agencies have a better gender balance? 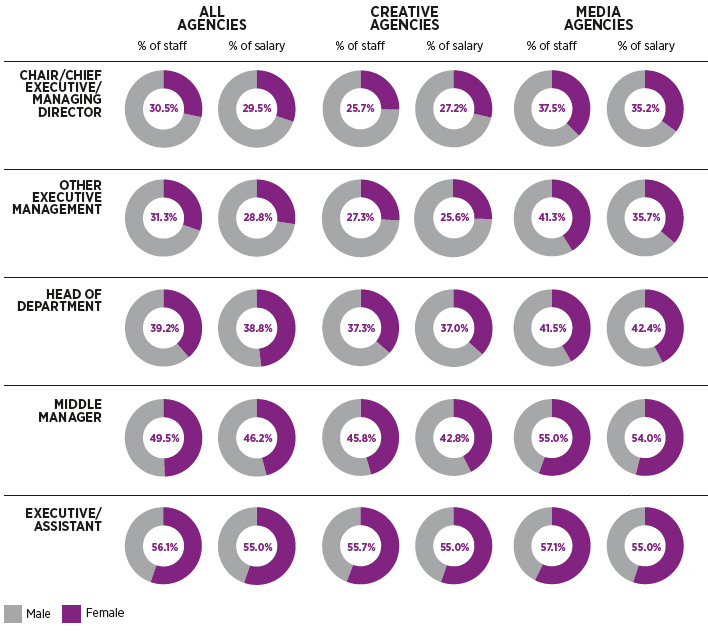 I’m genuinely shocked by the depth of the gender imbalance in the creative agencies surveyed. But when asked to explain why, it’s hard to contribute without falling into the traps of oversimplified thinking and, to be frank, patronising, facile "advice". But after various conversations – including with objective academics – I do think there is a clear and consistent pattern of gender imbalance, particularly in leadership roles, in almost all industries where creativity and innovation are highly prized. What is true of advertising agencies is also true of design, architecture, visual arts, film and gaming, to mention a few. 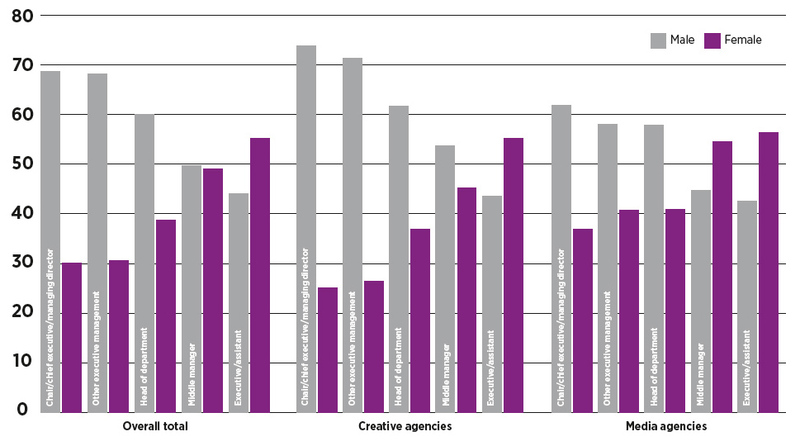 In reality, it is the media agency that is the outlier when it comes to gender balance in the creative industries. I think that we are dealing with a subtle but profound and deeply held (unconscious?) bias that "women are less creative than men" and that this belief is baked into the advertising agency for reasons of history. Research published in Scientific American suggests that, in certain contexts, people are more likely to associate creativity with men than women. To quote: "Women may be at an unfair disadvantage in workplaces where people at the top place a high degree of emphasis on creative and innovative thinking." 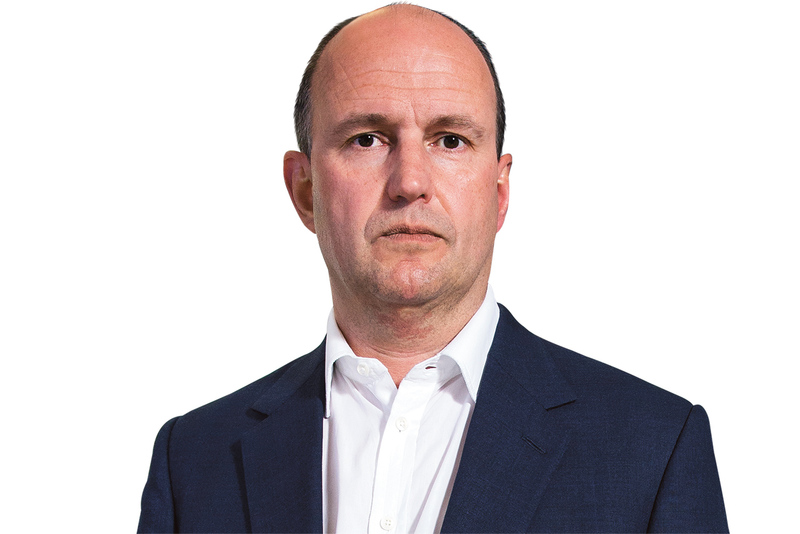 Having seen the enormous pressure that advertising agencies are under to continually deliver the "big idea" and often the fear attached to the risk of failure, I think it is disappointing but no surprise that many are held hostage to a deep-seated cultural bias that prevents the change the IPA proposes. 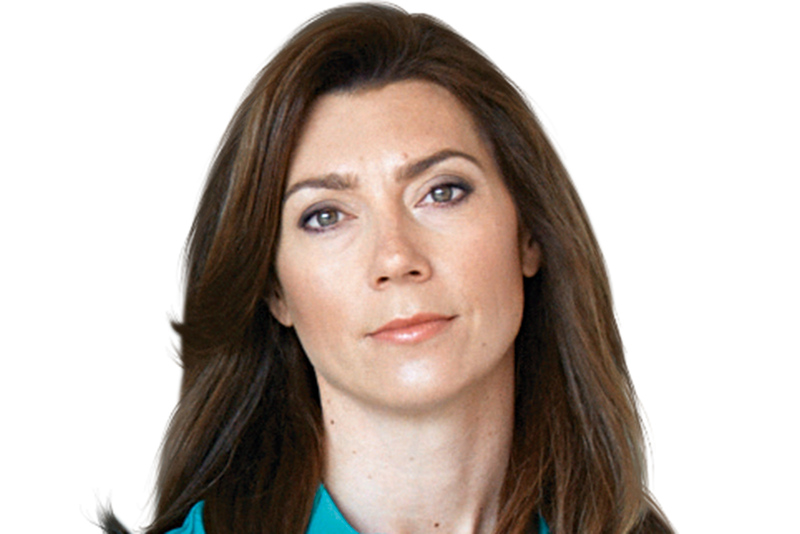 There is therefore a simple argument for why the "creativity gender myth" has not permeated the hiring and advancement of women in media agencies. Again, it’s about history and context. I’m sure that creativity has always been part of how the media agency has delivered its service, but our place at the table did not live on the origination of an idea. Historically, our job was to enhance that idea through media placement well-bought. To organise, to disseminate, to nurture; the fact that we as a business have now matured into more of an innovative ideas-based business has meant that our pre-existing attitude to women and men has come with it and our discipline is thriving as a result. We don’t have some magic serum that makes our environments more women-friendly – they are more women-friendly because they have had senior women in them for a long, long time. Media, especially in the UK, has always been full of strong, trailblazing women. Why? Maybe the fact that we are more data- and numbers-driven takes out subjectivity. Maybe because media has always been a discipline that requires collaboration and teamwork, so we don’t suffer any preciousness that can exist in some creative departments. 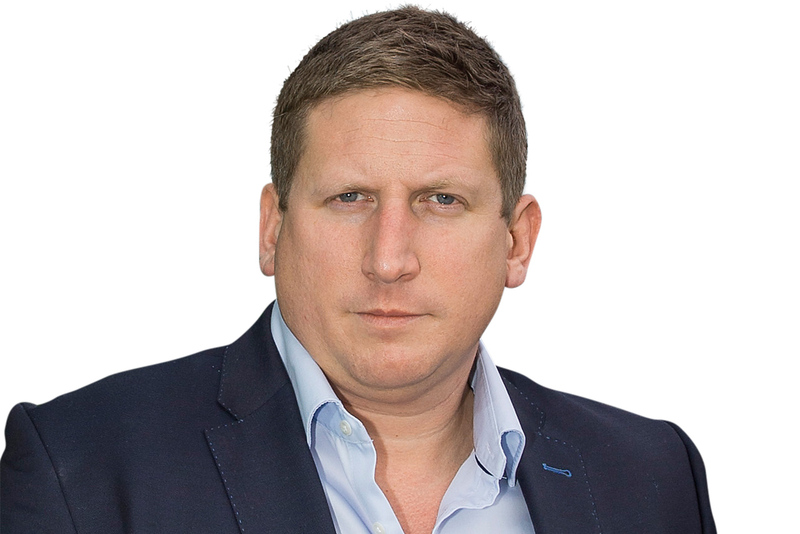 There is a strong business case, as well as an ethical one, to address here. Deloitte found that "companies where women make up a third or more of board members significantly outperformed their rivals, with 53 per cent more return on equity", and maybe media has always been more focused on ROI. But given that women make up 75 per cent of all purchasing decisions, to not have female creatives is nonsense from a business perspective. At Maxus, 40 per cent of senior leaders globally are female, but only 24 per cent across our executive committees are, so we are not perfect. But, in 2016, I have two major programmes to champion equality (a level playing field, not an unfair advantage) for women across the network to amplify our female talent while standing side by side with our male counterparts to drive business success. "Walk the Talk" will be a two-day training programme in three regions created to empower about 180 women to thrive. At the same time, we will work on a "Mind the Gap" initiative to ensure we pay fairly. We will look at best-in-class maternity and paternity policies. Maybe if we had more females at the very top (not back office! ), more of these initiatives would help pull other women up. Is there a pay gap? This chart compares the percentage of women in each job category with the share of the salary pot they receive. The data shows that women are paid less than their male counterparts across almost all grades, although the difference is marginal. In some instances – such as at the top levels of creative agencies – women actually earn slightly more than men. The small differences could be caused by the extent to which women are more likely to request, and be granted, flexible and part-time time working arrangements (see charts below). Fair pay is that trickiest of topics. The people who run the Best Companies To Work For surveys have always noted that "pays fairly" is the measure that companies always get marked lowest on by their employees, regardless of the industry they operate in. It’s human nature for people to think that their contribution exceeds their remuneration, and it’s capitalism’s nature to try to correct them. But sensible policies can make a real difference. There is nothing more corrosive than a perception that people of the same ability, doing the same job, in the same company, are being paid differently. Ultimately, the only thing that can correct them is transparent job specs pegged to transparent pay rates or bands. Then everyone – regardless of gender, race, orientation or background – has absolute clarity that pay is driven by merit and nothing else. Without the "noise" of guesswork and suspicion, the "signal" of performance-related rewards becomes crystal clear, and pay becomes a thrust factor for productivity, not a drag on culture. Our industry is way behind other professional services in doing this systematically and we need to catch up. 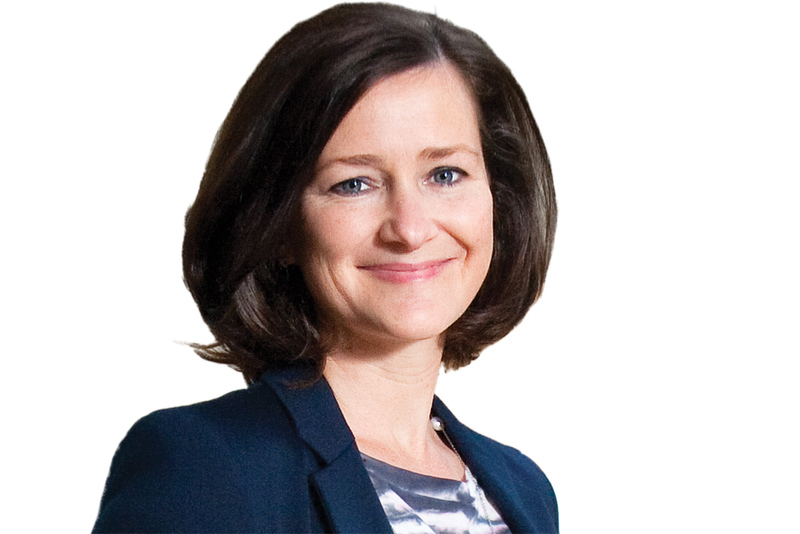 Agencies have adopted a range of flexible-working policies for their employees. The survey shows overwhelmingly that, at each level of seniority, females are more likely than their male counterparts to make use of these arrangements. This is likely to have an impact on progression through the agency and salaries earned. The percentage of individuals working flexibly is highest at head of department or above but still amounts to less than 20 per cent in each case. The research did not analyse the impact of employee hours – including flexible working – on salary, which might clarify pay differentials across genders. This will be included next year. These figures reveal the share of women making up each agency’s top two leadership levels – chair/chief executive/managing director and other executive management. Campaign and the IPA want this to be 40 per cent by 2020. The figure for WCRS looks odd, but the agency only has two roles in these categories. IPA member agencies with a gross income in excess of £20 million or more than 200 employees were asked by e-mail to respond to a short online survey. Fieldwork ran from the end of July 2015 to the start of October. In total, 37 out of 44 qualifying agencies submitted figures. Some agencies did not supply gender information. These are Dentsu Aegis Network, Imagination, IPG Mediabrands, Karmarama, Kinetic, McCann Manchester, Publicis and Wunderman. Those that did not submit figures say they do not have the processes in place to capture the necessary information. The government will require them to start gathering gender data later this year.All data was supplied by the IPA.